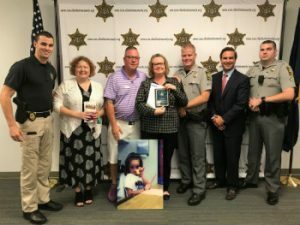 On Tuesday July 24th, 2018, Victim Services Volunteer and Charleston Area Victim Impact Panel (VIP) Coordinator, Paula Schaefer, was honored by the Charleston County Sheriff’s Office. Paula received the Good Citizen Award for her work with the MADD Victim Impact Panels here in Charleston. In attendance was MADD staff member Kelly Stafford, MADD Board Member David Lail, Paula’s husband Dino, Mt Pleasant Police Department Officer Thad Morgan, North Charleston Officer Chad Gantt, and two Charleston County Sheriff’s Deputies Michael Holt and Colt Arrington. Deputy Michael Holt presented the award after reading a narrative on why Paula won the award. Soon after, she was presented with a very large, metal encased frame with a picture of Sarah. The moment was an emotional one for everyone, including some of the audience members. After the ceremony was over, Paula received hugs from some audience members and police officers. This award not only recognized Paula, but all of our victims who passionately share stories of pain and loss with others in the hope of saving lives. For Paula, it was validation that her mission to save lives has truly touched people.